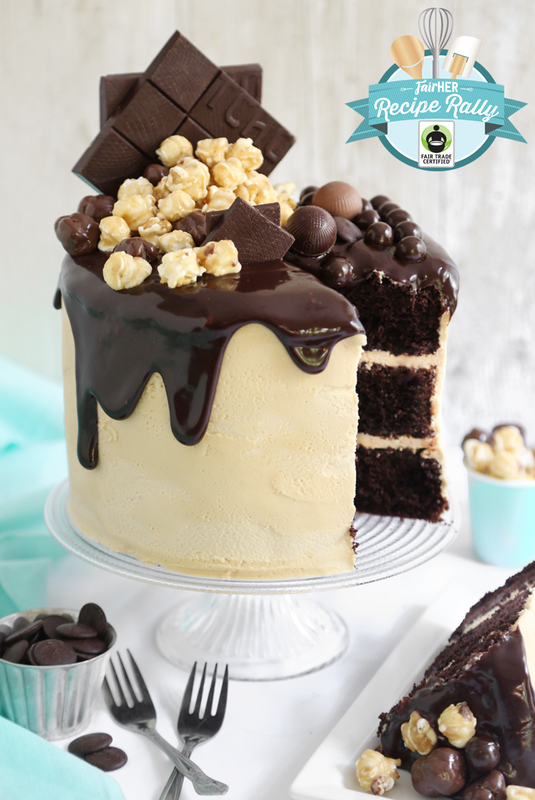 Caramel Chocolate Moxie Cake and a Fair Trade Giveaway! I always look forward to baking with Fair Trade ingredients, and this year's goodie box was filled with the most amazing baking cocoa and wafers. 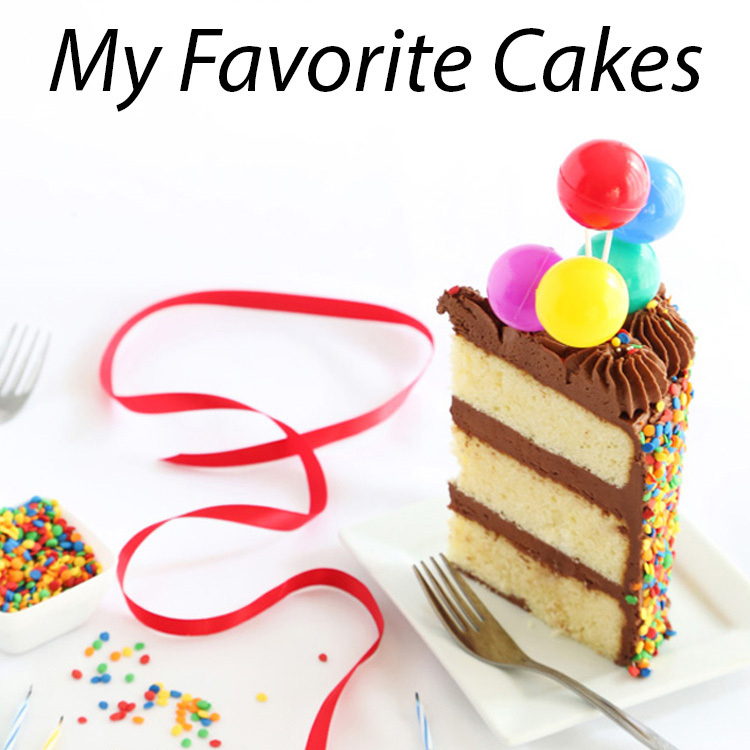 I decided to honor them in the best way I know how - by baking them into fluffy chocolate cake layers! The box also held many great bars, truffles and munchable snacks. 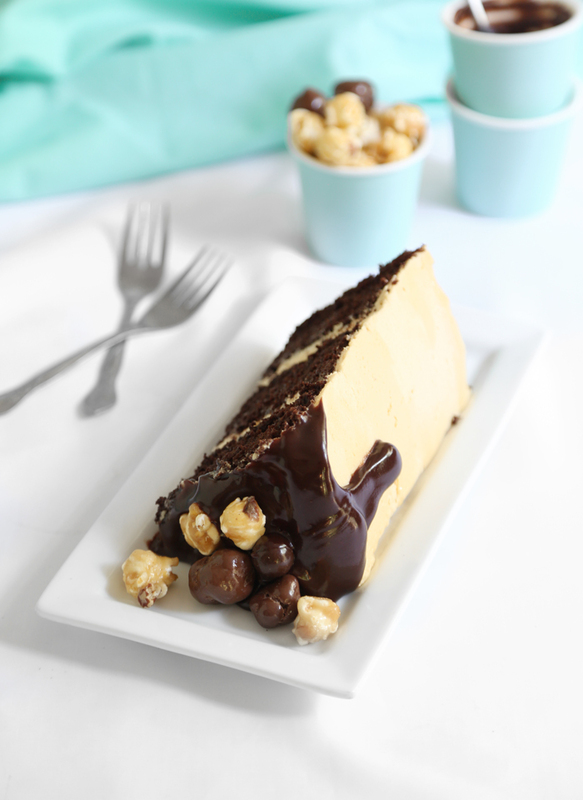 My favorite treat of all was the chocolate covered salted caramel popcorn by Marich, and that is what inspired the salty sweet flavors of this cake. And guess what?! We're giving away an identical box of goodies to one lucky reader! Thanks to our sponsors who made this giveaway possible! 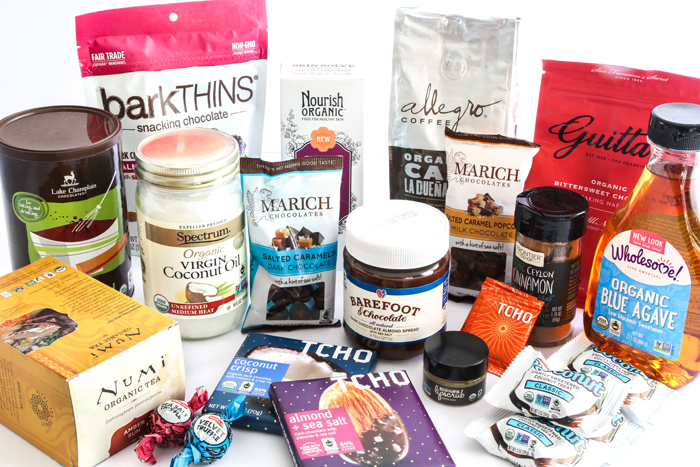 Wholesome Sweet, Allegro Coffee, BarkThins, Lake Champlain Chocolates, Nutriva, Numi, Guittard, Frontier Co-Op, Marich Chocolates, Barefoot & Chocolate, Alter Eco, Nourish Organic, Eco Lips, Spectrum Naturals, TCHO Chocolate. Each year Fair Trade USA pairs a blogger with a Fair Trade farmer to tell their story. Read below to discover how buying Fair Trade products positively impacts the people who grow our food. Natividad Nagua, 53, an organic banana producer affiliated to UROCAL since 2004, declares: "Before I used to produce conventional bananas, but I was not happy with all the pesticides we used, as it damages our environment. I attended a conference with a representative from UROCAL and I immediately joined. 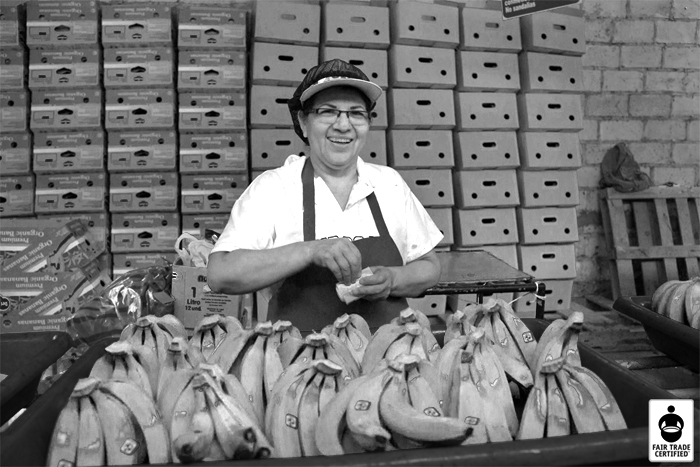 We now produce clean, healthy, organic bananas, and the advantages of Fair Trade are incomparable. The stability of the price we get for our product makes us feel happy, and at home. I am very worried about the environment and the effects it has on everyone's health. Of course we all need to make a living and get ahead financially, especially to keep our children from migrating. I want them to study, but at the same time I don't want them to forget their land, their roots. My message to the consumers in the United States is: Please buy our bananas because they are clean, healthy, they come from a small organic farm, and you can give them to your kids, parents, grandparents, grandchildren, without any worries." The recipe starts with my favorite chocolate cake layers. It's an unbelievably moist cake with the softest crumb. It's covered with salted caramel buttercream and then topped with drippy ganache. It's finished with a heaping helping of caramel corn and all the Fair Trade chocolate bars and candies I could throw at it! As a caramel fanatic, this may be my new favorite version of chocolate cake. With its crown of crunchy caramel corn and chocolate munchies, it's over-the-top in the best way possible. Good luck to all those entering the giveaway! You can read more about the benefits of buying Fair Trade and the FairHer campaign here! It may seem odd that this cake is baked at 300°F instead of the usual 350°, but the lower temperature helps the cake to retain moisture, and it doesn’t crown so you won’t need to level it before frosting. I don’t consider the caramel corn on top optional, but feel free to use your favorite candy bars and chocolate toppings for this cake. Make the cake: Preheat oven to 300°F. Grease three 8-inch round pans with shortening. Line bottoms with rounds of parchment paper and grease paper. Finely chop chocolate and combine it in a bowl with hot coffee or hot water. Let mixture stand, stirring occasionally, until chocolate is melted and mixture is smooth. Sift together flour, sugar, cocoa powder, baking soda, baking powder, and salt into a large bowl. In another large bowl with an electric mixer beat eggs until thickened slightly and lemon colored (about 3 minutes with a standing mixer or 5 minutes with a hand-held mixer). Add oil, sour cream, vanilla, and melted chocolate mixture to eggs, beating until combined well. Add flour mixture and beat on medium speed until just combined. Divide batter between 3- 8” pans and bake in middle of oven until cake springs back when pressed in the center, approximately 40-50 minutes. Make the frosting: In a 2 quart saucepan, stir together the granulated sugar and 1/4 cup of water. Bring the mixture to a boil over medium-high heat. Cook without stirring until the mixture turns deep amber. Remove the pan from the heat source and slowly add the heavy whipping cream in a thin stream while whisking constantly. Be careful with this addition; the mixture will bubble and steam when the cream in added. Use a long handled whisk to avoid a steam burn on your hand; stir in the vanilla. Transfer the caramel to a separate bowl and let cool until just barely warm but still pourable. In the bowl of an electric mixer, beat the butter and salt together until lightened and fluffy. Reduce the speed to low and add the confectioners’ sugar. Mix until thoroughly combined. Scrape down the sides of the bowl. With the motor running on low speed slowly pour in the cooled caramel. Beat on medium-high speed until completely combined, about 2 minutes. Cover the bowl with a damp tea towel so the frosting doesn’t dry out as you assemble the cake. Make the chocolate glaze: combine chocolate and heavy cream in a small saucepan and heat over medium-high until the milk begins to steam. Remove from heat and let stand 2-3 minutes; whisk until chocolate and cream and smooth and combined. Add corn syrup and vanilla. Whisk again until smooth. Place mixture in the refrigerator until thick but still pourable, about 10-15 minutes. Assemble the cake: Place a chocolate cake layer on a serving plate or cake stand. Cover with a layer of caramel frosting; repeat once more and top with the third cake layer. Frost the outside of the cake with the remaining caramel frosting. Pour the cooled ganache over top of the cake and allow it to overflow and run down the sides. 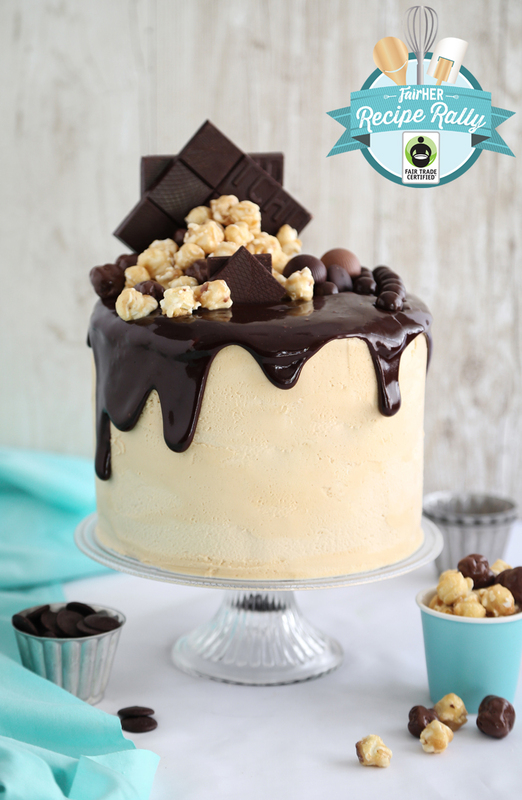 Insert candy bars standing upright into the top of the cake; top with caramel corn and chocolate candies. That caramel corn topping totally makes it! Wow! And I love the organic coconut oil! Oh gosh I can't help but say I want to attempt to make my own truffle with this amazing box! With those ingredients I just might succeed and impress the bosses! This cake is gorgeous! I love the toppings too, but most importantly that it supports FairTrade! 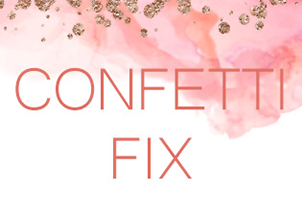 How do you decide which great product to choose as a favorite? I love the Bark Thins, Coffee and of course, anything chocolate! Hmmm, well, I think I would also make a chocolate cake with some peanut butter filling and icing and eat all that lovely covered popcorn as it baked in the oven! OMG, decadent doesn't even come close to describe your cake. If I had all of those ingredients, I'd use the cinnamon and tea to make some fun scones, the chocolates would probably be some kid and adult friendly beverages and baked goods, and the popcorn and bars would make movie night more heavenly. I'd like to make the biggest, baddest pancakes with these products! This cake is beautiful! And, I would love to make beautifully-decorated cupcakes with this haul! I think this cake would be the perfect thing to try first! I would make the richest, most chocolatey batch of brownies ever! I would make my husband a belated birthday cake! We were travelling over his birthday, so the cake kind of got skipped. :( I normally make him a chocolate cake with caramel icing, so this post really resonated with me!! Brownies sound really good. They're my favorite thing I love to indulge in!! I would combine all that chocolate and coconut into a delicious concoction! So fabulous! We are baking desserts for a local shelter's mothers day event... this cake might just go on the menu! How lovely! I'd use the coconut oil to whip up some sugar free chocolates for myself. What a generous and indulgent give away! Yum! I recently made a similarly over the top cheesecake, topped with all manner of tasty chocolates. I'd probably made a second version of that, inspired by whatever flavors in the box inspire me! Or I might just eat it, since I'm 9 months pregnant. Chocolate doesn't last long here! I would try really hard to bake something...but then probably just snack on it all. Ha!! I would try really hard to bake something with all that chocolate...but I would probably end up snacking on it all. Ha! My birthday is soon, I'd love to make myself some treats! I've been obsessing over your nebula cake, but perhaps something a little different might be in order! Thank you for doing this give-away! It's so fun to enter these things! I would try to bake something...but would probably end up snacking on it all. Ha! Maybe some sort of chocolate/coffe/mocha cake? i would definitely make some sort of batch of cookies, and while they'd be delicious, they wouldn't be as awesome as this cake! I would make this cake of course! Or this might be the year I make my own birthday cake, or perhaps I could make it for mothers day... so many choices, but they all come down to needing this cake! Hmmm...so many ideas!! But maybe some super indulgent truffles w/that good chocolate??? I would make a really rich chocolate cake. Hmm! I would probably make an epic chocolate cake with these! Or brownies! Or both! I want all of those things in that basket but I wonder if I could combine the coconut oil and LLC hot chocolate for a decadent drink..! 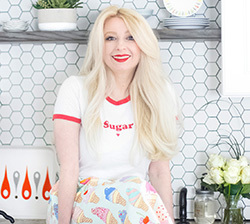 I would use the coconut oil to make a delicious coconut cake with salted caramel frosting!! I would make chocolate gelato, Mayan mocha mix, brownies, and of course, chocolate cake! Cookies! Or cake! Or maybe even cupcakes!! Cupcake versions of the cake would be awesome! Oh, I would make that cake for my birthday! It is SINGING my name! I am a Bark Thins addict (pretzel variety) and with this selection I coul try my own bark combinations, too! Cupcakes, for sure - so many yummy chocolates as inspiration! I'm with Erin on the margarita with the blue agave syrup! And I'd love to try to bake this cake -- sounds complex, but well worth the time and effort. 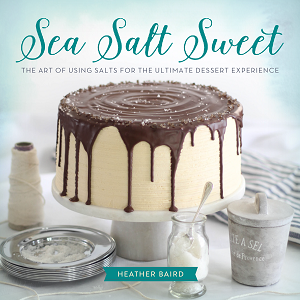 I'd leave the salt out of the caramel buttercream frosting -- I've reached real overload on salted sweet stuff -- but otherwise, wow, it would be delicious! I would make a much smaller version of this cake for my youngest's birthday (he's turning 6!). I think he would adore it. I would make a black forest cake and then some brownies! I would make a cake ! I LOVE LOVE Marich products! First off I would have to pop some of this chocolat in my mouth - for testing purposes of course! This cake looks AAAmazing! But I would go with something simple for the delicious chocolate to shine through, maybe salted caramel brownies or chocolate pudding. Hungry just thinking about it! I think I'd make a selection of fun cupcakes with all those goodies. I'd love to try this cake-it looks amazing! Anything chocolate has to be good. Your cake looks amazing! I'd make a Death by Chocolate Cake and probably nibble on a little chocolate too. I would invent things to make with these products! Thanks for the generous giveaway! Yummy! I would make a batch of coconut oil based chocolate-cinnamon granola! 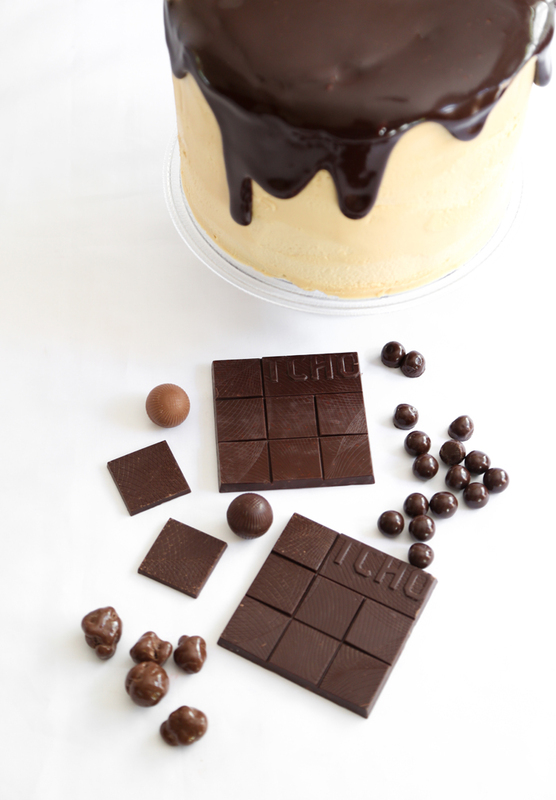 your cake might be a great place to start...but the possibilities are endless. oh my I'm going with the cake! Think I would make a cake alternating torte layers of chocolate and banana cake. Caramel, tart raspberry, and coffee filling. Chocolate ganache drip over caramel Swiss buttercream. I would love to make some kind of cupcakes with chocolate and coconut oil. This September my husband, Joe, will turn sixty...he is also being listed for a HEART TRANSPLANT. This would be a very special cake to make to celebrate both important and momentous occasions. It looks unbelievably delicious. I would make mocha fudge! 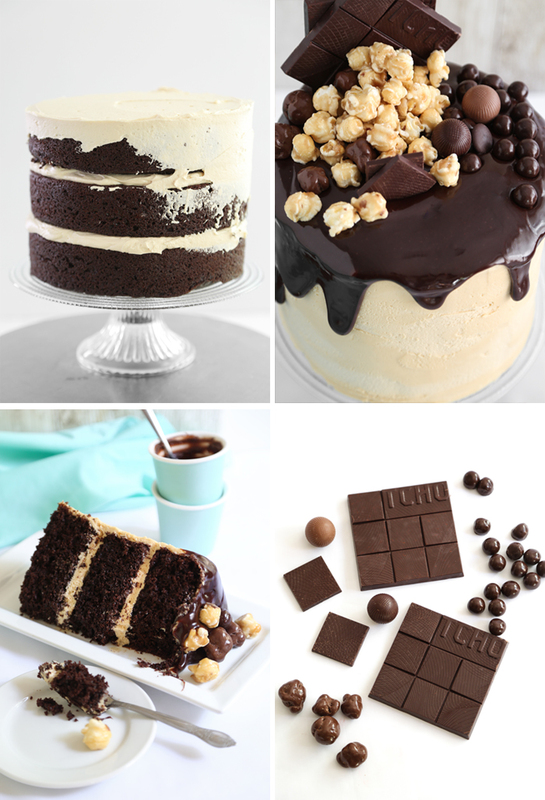 I would make a dark chocolate cake with french caramel buttercream. I would definitely like to make this amazing cake of yours and then my husbands father's day/birthday cake in June :D he's a huge chocolate fiend! Ooooooooh!! TCHO Chocolate is amazing!! And how could you NOT start by making this cake?! But seriously - anything made with this round-up of products would have to turn out perfect. Make with these products?! Many of these wouldn't last long enough for me to actually make something out of them. I'd eat them straight out of the package. I could probably find a way to use each of these products in the recipes I already make! I would use the coconut oil when making rice and the oil and cinnamon in oatmeal cookies. I would really like to try using the Bark Thins as the base for home made toffee....yum!! I would make brownies! Yum!!! Would love to make a rich chocolate cake (or cupcakes)! I'd probably make a cake or brownies. And maybe I'd make a milkshake using bits of the brownie or cake in it! And a caramel sauce on top! Yum! It would be perfect for the fondue party I'm wanting to have this summer! I'll definitely make chocolate cupcakes with chocolate ganache becuause there's this boy in our church who's father is in the army, and he absolutely LOVES chocolate. So I thought these would cheer him up. Yummy!!! I'd try my hand at chocolate coconut cupcakes! Thanks for the chance; this looks amazing! The first thing I saw was the Numi Tea and Agave sweetener and it made me want a cup so badly! So that's what I'd enjoy while contemplating what to do with all of the other treats! I would make a delicious batch of Chocolate fudge brownies, and anything else I can think of with all of these wonderful ingredients!!!!!!!!!!!!!! Will start by baking this wonderful cake, my granddaughter loves carmel and she will love this cake!!!!!!!!!!!!!!!!! I'd love to work with all of these products, but I think I'd start with brownies! The coffee, chocolate and coconut oil would be perfect for them. Oh my...what a wonderful giveaway. I would make a Chocolate Macaroon Cake to celebrate if I won....and, definitely will try your Caramel Chocolate Moxie Cake too. It's gorgeous! I think I'd make my flourless cake, which really showcases the nice chocolate. The agave would go on my morning oatmeal for sure. Well I would make your Caramel Chocolate Moxie Cake for Fathers Day! Serious chocolate cake, salted caramel frosting, chocolate ganache with those yummy toppings...what a way to thrill my dad (and I get to try out my new cake pans too)! I would definitely make this cake - looks phenomenal!!! I would like to try baking with coconut oil; to date, I have not had the confidence to do so, but if I won this brilliant giveaway, I would have the perfect opportunity to finally do so. I enjoy making cupcakes so salted caramel, chocolatey cupcakes would definitely be on my to-do list!! Thank you for this opportunity and great giveaway. This caramel chocolate cake you just shared. It. Looks. So. Good. Wow what an interesting box.. there is so much in there that I would like to try. Coconut oil and Agave are part of our everyday life. Never tried the Blue Agave though. I am learning to make ice creams and I think all the different kinds of chocolate would be wonderful to experiment with. Your cake is simply gorgeous. Not sure I could pull it off. Mine tend to have leaning issues. Cake? Ice Cream? Both? It's really hard to decide, but I'd probably end up gorging myself on chocolate while I made the decision. I would make a gluten free chocolate torte. Amazballs…..ur cake is epic!!!!! If I were to win this spectacular giveaway box……..hmmmmmmm, I would make a chai tea, coconut and chocolate bread pudding with a bark thin crumble! And to top it off, a cinnamon ice cream to boot. DELISH! I love how this is my first time coming to my blog after a pretty decent hiatus, and I see this amazing cake. I'd probably make a thousand cupcakes or use these in some kind of ice cream Frankenstein's monster cake deal. Cupcakes or brownies. Probably brownies. I am not good at making up recipes, so I don't know what I could make. Maybe I could make myself happy with almonds + sea salt. I would make an old fashioned chocolate sugar cake, for starters, and sip some tea while it's cooling. Wow, what an amazing box of treats! I would love to whip up some cookies with the chocolate and my son loves coconut oil on his english muffin every morning. Most of these look pretty good as they are. Maybe some chocolate cookies? I think I'd like to try a dark chocolate and coffee cookie bar first. I would eat the bark thins immediately and while I made some chocolate (cocoa) and banana bread. Those bars would make some fine hot chocolate! And I'd make some muffins too. I would make a super indulgent oatmeal topped with chocolate, coconut, agave, and some cinnamon! Oh, wow! What a cake! it'd be hard not to want to make that. I love GUittard chocolate; my fave for cookies. And I've been making and giving a lot of cocoa roasted almonds so flying through my cocoa stash. The rest of the goodies? Looks like one can have a cup of tea beside a lot of different amazing treats! Whomever gets the box will certainly enjoy! I'd love a salted caramel cake actually. This looks amazing! hmm... i'd love to make chocolate cake, of course! I would have to try this stunning cake! I'd like to try the recipe you posted! I would definitely use the caramels to make a caramel sauce. I'm dying to try a salted caramel cheesecake cake! I'm looking forward to trying that coffee with some muffins or brownies that I would make with that chocolate. Great cause, great campaign, and a fabulous giveaway! I would make a chocolate layer cake with all those amazing products. I'm happy to see some of my favorite brands in the mix. These fabulous ingredients would be perfect to use for my dessert spread that I am planning for our annual summer kick-off bbq! Thank you for the wonderful giveaway. While the cake looks delicious, I would love to make chocolate cinnamon rolls loaded with extra chocolate and maybe even some chocolate covered caramel popcorn on top...who says you can't have dessert for breakfast? While the cake looks delicious, I would love to make chocolate cinnamon rolls loaded with extra chocolate and maybe some chocolate covered caramel popcorn on top...who says you can't have dessert for breakfast? Ohhh I would have to make something really special. Maybe some layered brownies, or aged chocolate chip cookies. I bet the chocolate would make amazing truffles! i love organic ingredients in my baked goods...it's all good. I would definitely make this cake! And I would like to share this, if you don't mind, on my Giveaways for Good linky here (http://suchfuntogive.blogspot.com/p/giveaway-link-ups.html)...but I couldn't find an end date to list. (That's also something required by US law if you're hosting a giveaway, so you might want to add that regardles). It's an easy oversight to make. Those products look amazing, I think I would make a batch of coconut mound brownies but that cake looks super yummy so I could change my mind between the two. 'd love to make the Moxie cake for my niece's graduation party in June. I would love to make as many goodies as possible, but it definitely would have to include brownies! Your cake is amazing!! I'd love to make some rich, chocolaty brownies. I am making this cake!! I need to make that cake! Yum! The moxie cake and maybe some chocolate popsicles! I would make a chocolate mocha cake! My two favorite things mixed together, chocolate and coffee! I would love to make some healthy brownies! A tea infused cake would be first on the list. That chocolate spread would go into chocolate hazelnut rolls with puff pastry. I'd eat the bark thins while working out the rest of the baking list. Ice Cream Pie. Those Bark Thins and coconut oil are heading for the bottom layer of my spring form pan. The next layer is homemade coffee ice cream incorporating some of the firm chocolates. The final layer is a whipped cocoa moose with chocolate shavings and crumbled espresso brownies for garnish!! what an incredible giveaway!! i would make some serious chocolate chunk cookies! I would make lots of chocolate cake! What a great prize pack and your cake looks superb! I haven't had much dessert in the past couple months because I've been training for some marathons. I've done two in the past two weeks and I have one more in the middle of May, on my birthday. With all that said, I will be baking a cake the day after the marathon/birthday! Sometimes when I wait this long for dessert, it literally and figuratively tastes that much sweeter! This cake sounds so good! I would definitely be all over the chocolate -- brownies are my first choice of what to make. Thanks for the giveaway opportunity! I would follow your instructions- this cake looks like an excellent use of the goodies!! Well I wouldn't make anything right away, I'd just tear open the Marich chocolates, they're wonderful and hard to find here. Occasionally they show up at TJ Maxx. With fathers day creeping up fast, i would make something special for the two important men in my life, my dad, and my soon to be (in 3 weeks) husband. They deserve it. I'd make a pan of decadent brownies - mmmm! I would make some fudge frsoting with yellow birthday cake but the organic blue avage looks good too!!! I would make your cake first ... and then go from there! OMG, that cake looks amazing! Would love to play around with some different brownies and toppings/mix-ins. I would make my grandmother's crazy cake. I haven't made it in quite some time and it would be nice to get the old recipe out. I'd love to make a chunky chocolate chip cookie with a good quality chocolate! I'd love to make salted caramel brownies with the basket contents! I am always thinking of ways to make interesting homemade ice cream flavors! I could see Barkthins, fair trade chocolate bars, and coconut oil all bringing wonderful texture to ice cream. Even steeped tea/coffee makes a wonderful addition to ice cream--especially with some Guittard ganache folded in. A batch of salted caramel brownies or cookies could even be added to beer ice cream for a wonderful combination of salty and sweet. I would love to dress up cupcakes or a layer cake with these! I would like to make cake, LOTS OF CAKE !!!! I would make dark chocolate cookies with a sea salt caramel drizzle & a dream up a decadent cake or bar recipe. Yummers! I can see that the baking cocoa would be great for making chocolate spongecake, and the chocolate salted caramel popcorn would add a great salty crunch in between layers and on top! I'd like to make this recipe from the Guittard site: BROWNIES WITH ORANGE, CRANBERRIES AND ALMONDS. Yum! My granddaughter and I are baking together (she's 10);so, we'd begin with cooked to highlight the chocolate and to share with her brother. Then, possibly a treat fort her teacher nice the school year is almost over. Whatever we do will be great fun because we'll do it together! I would drink the tea, and probably try to make cakes or pudding with the chocolate. I like to cook pork chops and chicken breasts in coconut oil, so I'd do that with the oil. I too would make cake! It's my favorite!! I want to make that cake!! It's gorgeous! I would make a cake for my mom! I would love to make brownies. That chocolate looks so yummy!! I might just have a tea break and eat the barkthins. Not creative, but a much needed breather in a busy life! Chocolate cake! or just make some of the coffee and eat the chocolate straight up. Yum! If I didn't eat everything first I would love to bake this cake! And I'd love to do something with that cinnamon, maybe an apple cinnamon cupcake. Something with the cinnamon! An apple cake perhaps. And then I'd probably scarf down all that chocolate. I would attempt to make this cake recipe, it looks amazing. 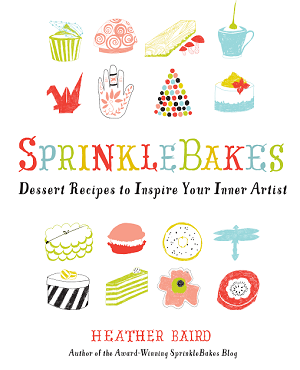 I would totally make a cupcake inspired by this recipe! OMGosh! I don't know for sure, but it would be decadent, like your cake! I would love to make a delicious dark chocolate brownie cupcake inspired by all those delicious ingredients. With one of the bark thins chocolate for some extra crunch on top. I am so glad you always support Fair Trade products! I find it inspiring that you take the time to think about where your ingredients come from. Love your blog! My dream Mothers Day is to spend the entire day (or morning) in the kitchen making this cake! What a fun recipe. I really appreciate knowing about this Fair Her campaign. Just followed the board....it's nice to have a resource to know which products are fair trade. Thanks!